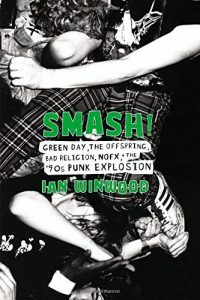 Having been submerged in the scene since nineteen eighty something or other and having lived through and, more by good luck than good management, survived the following decade when the world went punk shaped, as soon as Smash! arrived the cerebral needle that gauges my interest in all things literary shot straight into the redzone with such ferocity that it almost bent in half. Seriously, it was one of those moments when it was difficult to tell whether I was having a stroke or just dribbling with the sort of frenzied excitement that’s usually reserved for those moments when I stumble across rare Revelation Records pressings, first edition TSR D&D modules and strange and exotic American craft beers. Having ascertained that I hadn’t been struck by a catastrophic transient ischaemic attack and that I was merely suffering from being a little too eager and overwrought, I dived straight into Ian Winwood’s historical account of the period in question. One of the things that should be made clear right for the off is that not only did the author also live through and document the nineties affinity for punk rock in various musical publications, but he also has a passion for punk rock that’s both gratifying and a little overwhelming. It’s probably why he needed to write this book, so that he could find an outlet for that fervour before it totally consumed him, which I can completely relate to. The amount of research and fact checking that the author undertook to make sure that he didn’t wrong foot or misplace any of the major players at the centre of the explosion and that that bands, labels and individuals who paved the road were given due diligence is staggering. And it doesn’t hurt that Winwood is a bloody great writer whose natural wit and sharp, incisive style turns what could have, at times, become a dry and slightly repetitive read into a compulsive, interesting and intriguing page turner.